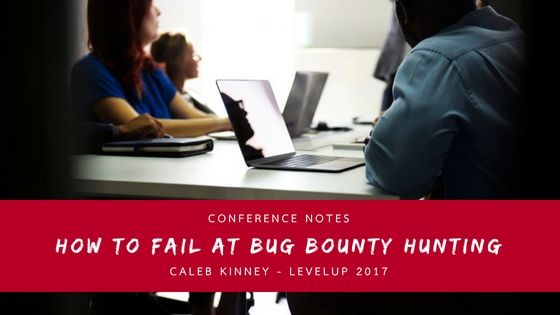 Hi, these are the notes I took while watching the “How to fail at bug bounty hunting” talk given by Caleb Kinney on LevelUp 2017. If it does, are you able to bypass any security controls? Ensure, before submitting your vulnerability, that nothing was overlooked: is your bug a false positive? Is it a known functionality? If you have any questions or suggestions, please leave a comment at the bottom of this page, a tweet or a message via our contact page. See you next time!